No I am not talking about the 70's/80's show but in my own little house! We had such a great Christmas! I loved that we kept it really low key and just full of fun and family. On Tuesday we had my Moms big family party. All the brothers and sisters came over to my place and we partied the night away. My mom always does some fun activity for the kids and this year she had them put on a play. I was so surprised because everyone of them did what they were told to do and even kept their costumes on. Christmas Eve... We had a great time hanging out at Ryan's sisters place for a little while. We got to see some really great family friends and have some yummy food. We couldn't stay long because we then ran off to one of my sisters party. That place was full of every kind of food you could think of. My sister Amy and Kristianne made some traditional Danish dishes and treats that my Grandma used to make. AHH they were so yummy! Lots of friends joined us there and we all just had a great time. After we got home around- 1 am. Ryan still needed to wrap my gifts and I just cleaned up the front room a bit, and we were off to bed. 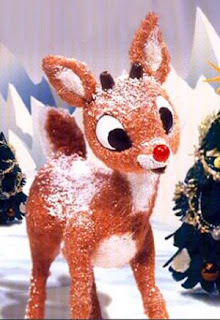 Christmas!!!! We got up about 9 and opened our gifts to each other. I got a IPOD dock and a digital picture frame. Ryan got a range finder and lots of other hunting things. After our morning we rushed off to Ryan's sisters to watch Addison open her presents!!! 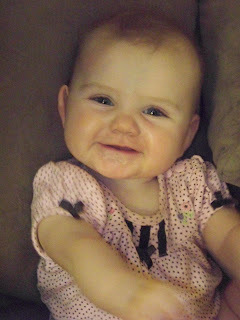 She was so cute. I loved seeing how confused yet excited she was at the same time. We had a great breakfast then went to Ryan's parents to open some additional treasures. It was then time to visit all the grandparents! It was so fun to see them all on such a great day. We even squeezed in some movie time. Ryan and I went and saw Marley and Me. AH my new favorite show. Maybe because I am so inlove with my Harley but it was such a great show. For those who really know us and know us since we got Harley- That movie is exactly like our story. Our dog was the WORST dog ever when she was little. We had to replace doors!!! Floors, blinds, clothes, shoes, toys, beds! She is not as bad now but still gets into trouble from time to time. After all our holiday fun we went to my Moms house to call Jonathan. It was so great to talk to him. He sounded so grown up it was really weird. He is doing so good and is really really happy. We had a great talk and I just cant wait for one more year to pass and he will be home! By the time we headed out the storm had started. What usually takes us about 30 mins to get home from my moms house took us 2 hours! The roads were just horrible. We couldn't see anything. Luckily we made it home safe and sound! I forgot my camera but ill post pics asap. We really had such a great holiday. I am so grateful for all the people in my life and all the great blessings I have. Only 3 days till Christmas! I love this time of year. I cant believe one more year has past and a whole new year is to come. Its always so exciting to reflect on whats happened over the last 12 months. I worry yet am so excited to see whats up next. I talked to my brother Ben who is in Korea on the phone this morning. Every time I talk to him I just hurt how much I miss him and my nieces. He had a little accident last week on his motorcycle. Believe me- I have seen Korean drivers- I'm just so grateful he was able to walk away. His bike is not in the best of shape and he got pretty banged up but its so good to know he is okay. One more thing to add on my list to be grateful for. He always has the best attitude and whenever I felt a little down I either need to talk to him or remember things he has told me! I'm excited for this time of year mainly because I know ill be able to be with family. Tuesday is my family's Christmas party. We will then bounce back and forth from my family and Ryan's family parties on Christmas eve then Christmas day will be filled with the Webster side! 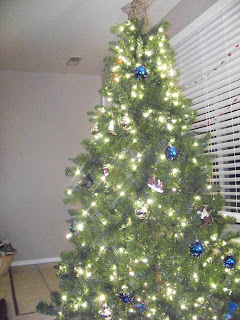 Here is our home with a little extra cheer! We really don't have a certain theme to our tree. We have more cowboy-hunter type ornaments but we also have lost of others as well. 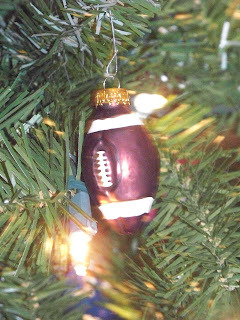 I love our football ornaments! 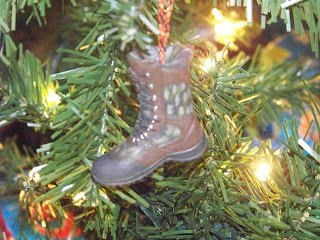 Part of our tree is full of the hunters in us. Yes this is a hunting boot. We also have a hunting vest, hat and plenty of deer! Harley does have her own ornaments as well! 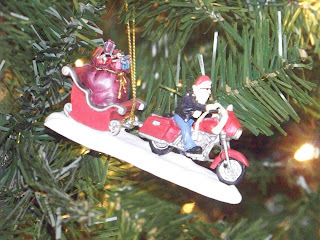 We got this awesome Santa riding-what else- but a Harley Davidson! She has a few others like this!! I was thinking about last year and how Ryan and I were in a place where we were able to give so much more than we were able to this year. I felt a little sad because I know we really made a difference in some children's lives and this year we did what we could but just not as much as I would have hoped. Do any of you do anything special this time of year? Do you go beyond family and friends and help people who really need help? People you may not know? These 2 are so adorable. 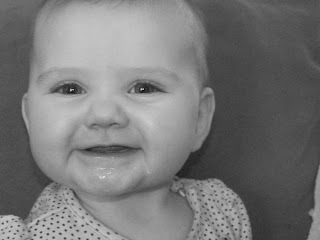 Teagan now has this new smile I just melt over. 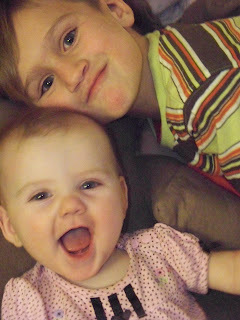 Just had to put some really cute pictures of them up here! 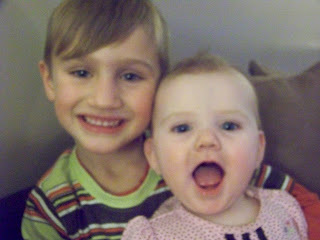 I don't think I can really say how much I adore my nieces and nephews! As I was looking through my big file of photos I found a file my brother sent me from his trip to SLC back in Aug/Sept. During that trip we had a family party in an attempt to get a family pic of all the grandkidos. Unfortunately my little Sarah Bear who lives in Idaho couldn't make it but everyone else was in the pic. Kian who's head is almost cut off at the top and Anna who is buried in Ellie's hair barley made the picture but hey you try to get 15 kids to sit still while looking at a camera. I love to look at this picture because its full of some of the best things in my life. 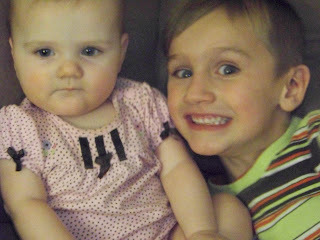 My nieces and nephews are so amazing to me. They fill the world with so much love and peace. I know those of you who have nieces and nephews your close to can totally relate. 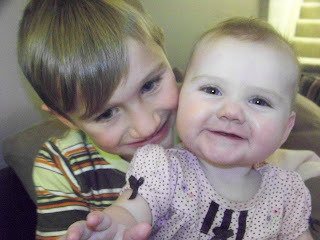 I cant imagine the love ill have for my own children because I don't feel I could love anyone more than I love these kids! I guess that will be a love that is so powerful I couldn't even imagine it right now. Olivia, Devlin, Tyler, Lucy, Aidan, Amalie, Ellie, Bitna, Yuna, Anna, Donna, Mina, Kailum, Teagan, Kian. Happy 102 Post. I was going to do a huge she-bang for #100 however in my slack of a self I didn't pay attention as Mr 100 came and went. Plus who cares about 100? What makes him so special. 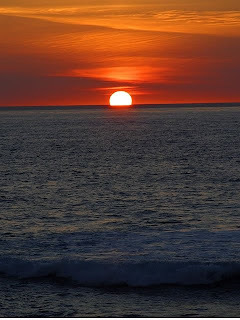 I say Ms 102 is just as spectacular! So Ms 102 is the post about my material LOVES. I am not a huge accessorizer. Mainly because I just don't know how. I see others and envy their style. I usually wear a neckless and earring- usually that's as far as I go. 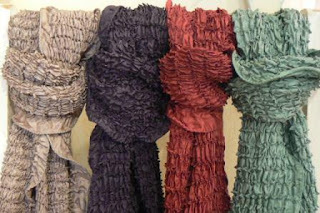 One accessory I do love and think I usually can pull off other than the basic jewelry is scarfs! I have just a couple really fun really ME. Bright colors and some just settle for when I bring out my bright coats. 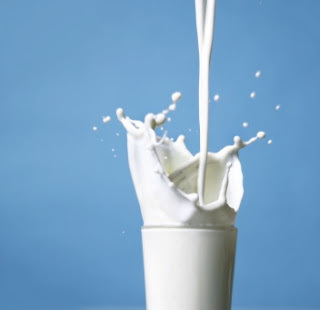 If I was asked one thing I couldn't live without- Other than Ryan I would without a doubt say MILK. Seriously I would probably give up on life if I became lactose and tolerant. I live for MILK. That might be a little strong but I just love this stuff! AH MILLLK.. I am very very picky about what kind of milk and how cold it NEEDS to be. Non of that luke warm gas station milk- EWWW! You know that saying "Theres always room for pie" Well for me its definitely NOT pie its Popsicles! 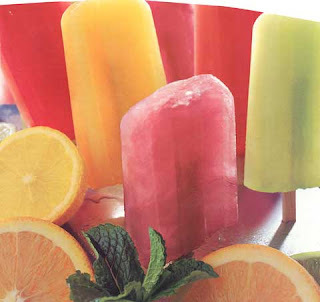 I can never be to sick or to stuffed for a yummy cold fruity Popsicle! This is a new found treasure! Bath and Body Works Cashmere lotion! HALE LU YA! This stuff is NOT on the cheap side of lotion for me but I just melt when I use it. It leaves this smooth lather that smells awesome. I try to use it sparingly but that never happens. I love this stuff! Kenny C. has some amazing songs. I really don't think I have ever any music from him that I don't like. One of my most favorite songs he ever wrote was "I Will" When Ryan and I got married we didn't exchange vows so I really wanted something that we gave each other at our wedding that we could remember forever. We decided to dedicate a song to each other and we wouldn't know what the song was until it came on at the wedding. This was the song Ryan chose for me. 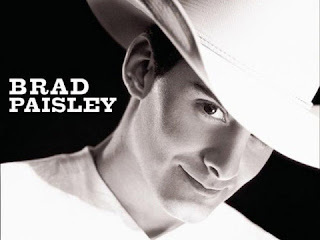 Brad Paisley. This incredibly talented guy can turn the weirdest things into my most favorite songs. When his song "She's Everything" first came out I fell in love with it. I kept thinking it was the cutest song I had ever heard. When Ryan and I were listening to the song one day he said- this song reminds me of how I feel about you. So it became our song. We played it as our first dance at our wedding. Anyone who knows me knows I'm just a little obsessed with FRIENDS. Every DVD and game is constantly on show at my house. I cant get enough of them. ALL 6 OF THEM. 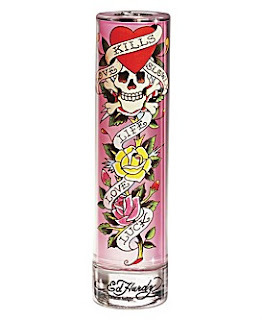 Oh Mr. Ed Hardy. I have seriously spend more money than what should be legal on this brand. Why am I so in love with it? I don't know. Its hard to explain! The perfume, the shoes, the sweatshirt and tshirts over take me. I wish there was an Ed Hardy Anonymous! I started to shop for Ry over 2 months ago. He is all done and so is everyone else we shopped for. Ry keeps asking what I want and I really cant say. I have not even thought of that and don't think ill ever find time to. Between work, school, family and just other little surprises over the last few weeks I am completely over whelmed with anything and everything but myself. Yes many of you will think- FINALLY! he he. It was so relaxing and enjoyable. We ran by my Momi for dessert. She made yummy pies. We had a great time just being with the family that day. The weekend before Thanksgiving Ryan's Grandpa Arvel turned 90!!! I am very upset with myself but I didn't have my camera so no pictures! We had a fun time though and GPA Arvel looked amazing. He is such a wonderful man and I am just so lucky to have met him. I don't know what it is about Grandparents and why they are so amazing but they are. So school is almost out for the semester. I finished English last night with a big bang of our final project presentation. My group has been working on this since September and I cant tell you how happy I am to have it OVER! Tonight I have Psych and ready to get that final over and done with. Next week I have my math final.... Seriously- School needs to END. I get almost a month off then ill be back in January! I love being able to cross all the classes off my list in order to graduate. My list is still very long since it included my classes to get a bachelors but its still very exciting! BTW- For those who know me know I HATE math and guess what. I'm taking my last math class next semester!